As usual when picking up a new book, I glanced at the back cover of Abusing Scripture. Both reviewers were highly supportive, but what was not clear to me was the meaning of some of the words. I reached for the dictionary: "the perspicuity of Scripture" means lucidity or clarity. There was a hint that, had I been from the Reformed tradition, I would have known that one. For clarity about this phrase in the second review:". . . those who would cage the Bible with obscurantist, selective and bowdlerized readings, . . ."I finally learned from Webster's Encyclopedic Dictionary that such a one "opposes the progress of knowledge . . . to prevent enlightenment, inquiry, or reform." "Bowdlerizing" has to do with "expunging texts of objectionable matter, on moral grounds." Apparently it comes from a nineteenth-century man named Bowdler who expunged parts of Shakespeare so he could be read "with propriety" in the family. If, like me, you are neither a theologian nor a professor, no need to fear opening the covers of Manfred Brauch's Abusing Scripture: The Consequences of Misreading the Bible. Brauch is a retired professor of biblical theology and past president of Eastern Baptist Theological Seminary (now Palmer Theological Seminary) in Philadelphia, Pennsylvania. His book is quite readable as he is careful to keep his lay readership in mind. Professor Brauch is writing primarily to evangelicals who, like himself, hold the Bible as the unique word of God, guiding our faith and daily practice. Brauch contends that those who claim this high level of commitment to Scripture are the more accountable to rightly divide the word of truth. Yet, Brauch claims, "on a regular basis, in our interpretation and application of the Bible, we grievously abuse Scripture; we do violence to its message and meaning"(16). Like all abuse and violence, this type of abuse has consequences. 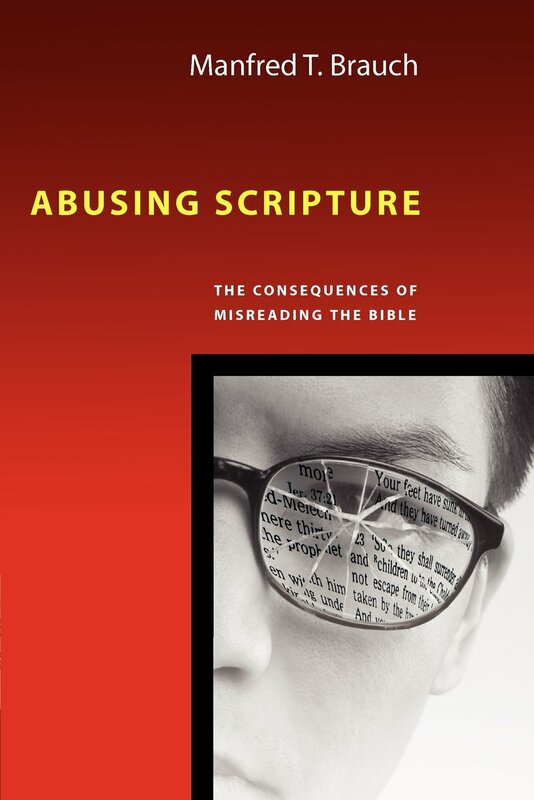 Not only does it distort the meaning of Scripture, but also prevents the Christian witness from being effectively presented, and it contributes to the abuse and brokenness in our world. Instead of focusing on relatively benign misinterpretations of Scriptures that may affect doctrinal nuances or end times issues or the structures of ecclesiastical life, he zeroes in on "abuses of Scripture that have serious negative consequences, both for the health and vitality of congregational life and for the way the Christian message is heard and experienced by outsiders." The author focuses on the following three areas: "(1) The use and justification of force and violence in human affairs; (2) the relationship between men and women in home, church and society; and (3) the concern for justice and the sanctity of life in all areas of human relationships, institutions and culture" (20-21). For the purposes of this review, I will limit my illustrative material to the second of these three areas of concern-the relationships between men and women. Professor Brauch identifies six types of scriptural abuse and devotes a chapter to each of them. The first five are the abuse of the whole gospel, the abuse of selectivity, the abuse of biblical balance, the abuse of words, and the abuse of context: literary and theological. CBE readers will find a great deal of familiar material affirming the good news of biblical equality in many of these chapters, particularly in the abuse of selectivity and the abuse of words. For anyone who prefers skimming a book before deciding whether and where to delve in more deeply, there is a helpful section at the end of each chapter called "Avoiding the Abuse of [whatever the chapter topic is]." In addition to giving a quick summary, this approach gives the reader a list of guiding principles and resources, thus ending each chapter on a positive note. In chapter 7, "The Abuse of Context: Historical Situation and Cultural Reality" — Brauch's longest chapter, comprising almost one-fifth of his text-the author breaks new ground with the use of a tenacious Christocentric emphasis. Paradoxically, Brauch recognizes that in this chapter he is dealing with "what may be the most sensitive, difficult and controversial issue in the interpretation of the Bible" (182). Yet, he repeatedly insists that Christ is the "central hermeneutical key" to help us avoid abusing Scripture, given the many historical situations and cultural realities in the Bible-written by numerous authors over a thousand-year span. A fundamental assumption of Professor Brauch, presented in chapter 1 and again in chapter 7, is that both the written word and the Word made flesh are incarnational in nature. Just as Jesus, God in the flesh, lived in the context of human history, so "the entirety of Scripture is historically and culturally embedded and conditioned . . . When God surrenders his speaking to historically/culturally conditioned and limited (even sinful) hearers and witnesses, 'God makes his words vulnerable' to misunderstanding or partial understanding" (202-03). This may sound like a dangerous, heretical statement. But, argues Brauch, it does not lessen the word's "overarching authoritative character" any more than does the "enfleshed" Word in Jesus "lessen his authoritative presence." It does mean, however, that we need to hear, interpret, and apply the Scripture with careful attention to this contextualization, to this "human location" of Scripture. Brauch carefully guides us through an understanding of questions, such as: How do we determine what, in Scripture, is intended only for the historical context in which it is given? What, in Scripture, has an authority that transcends that historical situation? Brauch begins by pointing out that in Scripture itself we find our core hermeneutical criteria for determining what is historically limited, what is a distorted understanding of God's abiding truth, and what has authority for all time. Many such examples are found throughout Scripture, not the least of which is Jesus. Repeatedly, he used the now-familiar words, "You have heard . . .but I say unto you . . . ." Logically, what follows is what I wish to highlight: Brauch's assertion that Christ is the central hermeneutical key. Christ is central both because we name him the Word of God, God's ultimate self-disclosure, and because Christ's words and acts are "normative and paradigmatic” (248). This pervasive and multifaceted witness to Christ as the one in and through whom God's self­ disclosure comes to its fullest and final expression, superseding all that has come before him in the progressive unfolding of God's redemptive work, has absolutely crucial and primary significance for the hermeneutical task [of] . . . distinguishing between that in Scripture which is culturally and historically relative and that which has abiding authority. God's ultimate self-disclosure in Christ is the irreducible hermeneutical key. As the "light of the World" (Jn 8:12; 9:5), it must be allowed to shine both backward (across the pages of the Old Testament revelation) and forward (across the pages of the New Testament revelation). Christ, in his person and work, his life and acts, is the hermeneutical lens through which the entire preliminary faith tradition of Israel and the subsequent witness of Jesus' earliest followers must be evaluated. . . . Both Paul and John are one in the conviction that the glory of God, that is his redemptive presence, is most fully disclosed in the crucified one. Therefore, in the written Word of God, whatever blossoms in the light of the cross has abiding authority for Christian faith and life and mission; and whatever withers in the light of the cross is culturally and historically relative (229). I grew up in a Mennonite church that strongly held to the Bible as our guide to faith and practice, yet unabashedly spoke of "progressive revelation" because Christ was always the center and high point of that revelation. This image was clarified for me at a conference thirty-five years ago when I was first introduced to an overarching view of the Bible that emphasized creation, fall, and redemption as central points in redemption history. That weekend transformed my thoughts and my feelings. Jesus became very precious to me as I embraced a frame of reference, a hermeneutic, that allowed me to see the Bible not simply as a set of stories strung together as individual narratives, not as a set of proof texts to fit a certain denominational framework, but, rather, as a living, unfolding, liberating, and empowering cosmic drama that has allowed me to claim my status of full membership in the drama and in the new community that Christ ushered in, together with all the rights and privileges appertaining to that membership! N. T. Wright's image of the Bible as a four-act drama correctly adds "Future Hope" as a fourth act, placing all of us in the middle of the drama.1 William Webb's image of "redemptive movement"2 in history has also helped me understand the progressive unfolding of God's self- revelation. I am not a football fan, but his image of the "ball of truth" in Scripture, being passed forward toward the goal, although not necessarily reaching it, is an apt one. In his concluding chapter, Brauch sketches a vision of how transformed our work and world might become if we allow the incarnational word and incarnate Christ to reign in our hearts and lives: We might truly see God's kingdom come and God's will be done on earth as in heaven. Brauch, with a passion strong and deep, writes because he loves the Lord, the church, and the world. His aim is to halt the abuses of people and societies that result from the abuse of Scripture-abuses that prevent the full revelation of God from being experienced in our lives. I am personally newly empowered and heartened to imagine taking Christ, not only as Lord and Savior, but also as the shining light and revealer of God's abiding truth with me as I approach the Scriptures. May this outstanding book bring further life and light to all who read it. 1. N. T. Wright, The New Testament and the People of God (Minneapolis, Minn.: Fortress, 1992), ch. 5. My introduction to Wright came through Mary Stewart Van Leeuwen. See her Gender and Grace: Love, Work, and Parenting in a Changing World (Downers Grove, Ill.: InterVarsity, 1990), ch. 2, and My Brother's Keeper: What the Social Sciences Do (and Don't) Tell Us About Masculinity (Downers Grove, Ill.: InterVarsity, 2002), 35-42. 2. William J. Webb, Slaves, Women, and Homosexuals: Exploring the Hermeneutics of Cultural Analysis (Downers Grove, Ill.: InterVarsity, 2001), 36-41.